What is more important than good times and happiness? This decanter is the perfect excuse to get together with your nearest and dearest. Get together and reminisce over happy times with Mum this Mothers Day. Invite your friends round, fill the carafe with you favourite tipple and settle into an evening of laughter and chatter. 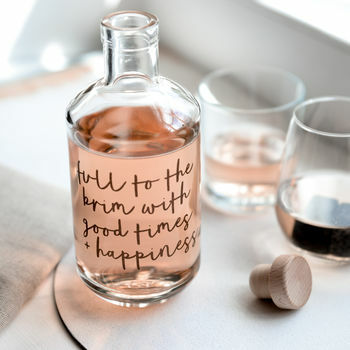 This high quality glass decanter has the text 'Full to the brim with good times and happiness' printed directly to the glass. The carafe is available in black. Each decanter comes with a wooden stopper. Please note that the black text will show best on when the decanter is filled with lighter liquids. The wine is not included. You can also purchase a funnel when you place your order to make decanting that little bit easier. There's nothing worse than something being shiny and new becoming old and tired, so if you would like to keep this bottle looking first class the best way to care for it is to hand wash gently in warm (not hot) water. Please do not put this in the dishwasher or the microwave.